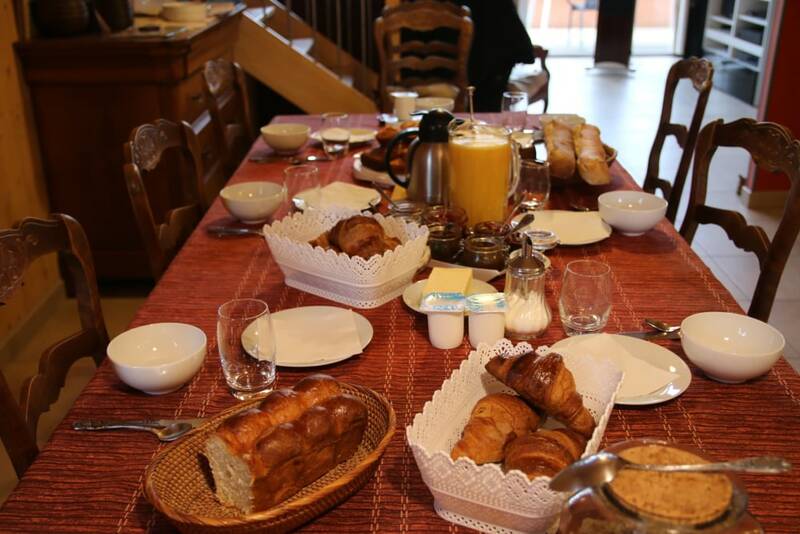 Our continental breakfast includes: coffee, tea or chocolate, orange juice, fresh and toasted bread, pastries, brioche, homemade cakes, homemade jams, dairy products, muesli, fruit. English-style breakfast lovers may request boiled or scrambled eggs, with or without bacon, cheese. Breakfast is 8.00 € TTC and it is offered to children under 10 years. You can book it upon arrival. The host table is a moment of exchange. All our dishes are cooked on site based on fresh products. Our menus are elaborated according to the arrival and the seasons. We strive to marry pleasantly the wine and the menu of the day. We take into account intolerances, food allergies and special diets, so do not hesitate to let us know at the end of your booking form. The menu includes: an appetizer, meat or fish garnished, cheese platter, homemade dessert, wine and coffee. Price: 25.00 € TTC per adult, 15.00 € TTC per child from 8 to 14 years, offered for children under 8 years. On reservation at the latest before 14 H the day of the arrival.On reservation at the latest before 14 H the day of the arrival. This formula is very appreciated by those who prefer a light meal in the evening and those who arrive after 8 : 30 PM. It can be served on the mezzanine or on the terrace if the weather allows it. The meal tray includes: soup or salad, cold meat or delicatessen and homemade dessert. Price 15.00 € TTC per person. On reservation at the latest before 2 PM the day of the arrival. We have at your disposal: a baby bed, a high chair and a baby monitor. 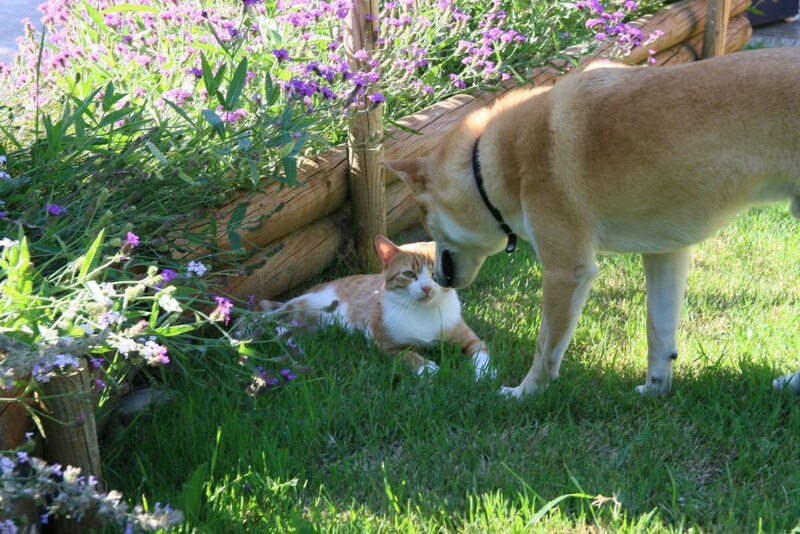 Our friends the pets are welcome at Maison ADDAMA, limited to one dog per room. We ask our guests to keep their dog on a leash inside the property. At 20 meters from the house, a portion of road closed to the traffic allows to walk the dog safely. In our private and closed parking one space is allocated to each room. This service is offered and does not require prior reservation. Electric vehicles will be able to refuel free of charge. We have 2 charging stations. 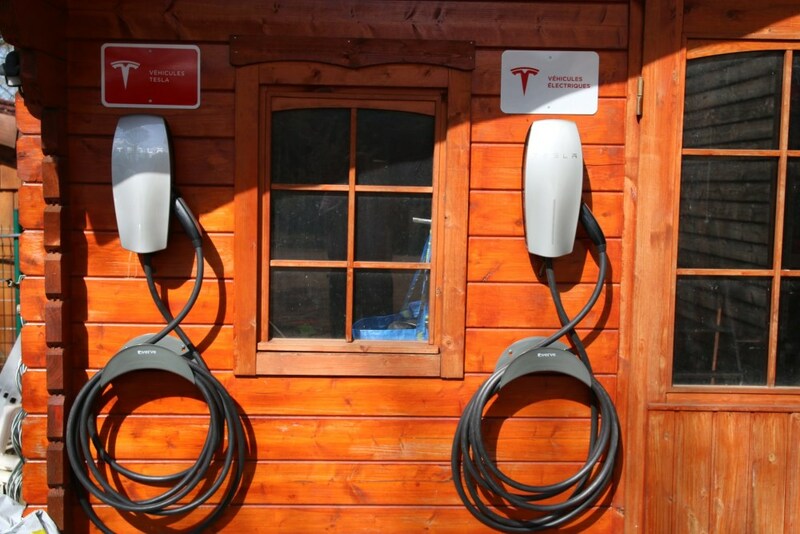 The one on the left is specific to TESLA, and the one on the right is compatible with other brands. Please indicate when booking so we can keep parking spaces near the terminals. Bicycles can be parked in shelters from the weather in the garden shed. Our heated pool (26 ° minimum) is available to our guests from 10 am to 10 pm Its access is secured by a fence and a gate with child safety. It has a maximum depth of 135 cm. We inform our guests that children of 150 cm are only allowed in the swimming pool if they are accompanied by a responsible adult.